The bass player position became available following last year's highly successful 30th Anniversary To Hell With The Devil Tour, which saw record crowds and featured STRYPER’s largest sound and lighting production in nearly two decades. Perry becomes only the 3rd bass player to fill that slot in the band’s 34 year career. Richardson is best-known as a founding member of the multi-platinum band FIREHOUSE, who exploded onto the scene in the early 1990s with hit singles like “Don’t Treat Me Bad”, “Love Of A Lifetime” and “When I Look Into Your Eyes”. In 1992, the band took home an American Music Award for Favorite Heavy Metal/Hard Rock New Artist, beating out both NIRVANA and ALICE IN CHAINS. Since departing FIREHOUSE, Richardson has remained active touring with various artists including Trace Adkins and Craig Morgan. 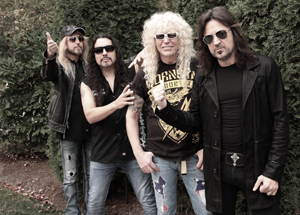 "Perry is a perfect fit within our band," adds STRYPER frontman Michael Sweet. "He's an amazing singer, an excellent bass player and just a great human being. The moment we first rehearsed with Perry we knew that it was right. We sang harmonies and the vocals sounded awesome. He shared stories of how STRYPER was one of his favorite bands and that he's always respected us. It meant a lot to hear him say that. He has brought a kind and humble spirit to the band. He is a professional and an absolute gentleman. His resume is quite extensive and as impressive as it gets. We're honored to have him on our team and we're extremely excited about the future!" STRYPER continues to dominate the hard rock/heavy metal scene. Their ninth studio album, Fallen (Frontiers Music SRL), was released in October 2015 and debuted at the top of the Billboard charts including #2 on the Top Hard Music Albums chart, #2 on the Top Contemporary Christian Albums chart, #2 on the Top Christian/Gospel Albums and #5 on the Top Current Rock Albums chart. Rocking since 1984, STRYPER is responsible for such classic '80s metal albums as Soldiers Under Command, To Hell With The Devil and In God We Trust. In fact, STRYPER is the first band to ever have two songs in MTV’s Top 10 simultaneously with their hits “Free” and “Honestly”. After a sabbatical for much of the 1990's, STRYPER returned strong in the early 21st century. To date, the Dove Award-winning and GRAMMY-nominated band has sold over 10 million records worldwide.